It was beginning to feel a lot like Christmas Friday afternoon in the National Music Museum. The 147th South Dakota Army National Guard band performed seasonal favorites for an audience, including kindergartners from St. Agnus. The band had nine people, with mostly brass instruments and percussion. The concert was full of familiar classics with some more modern Christmas songs. 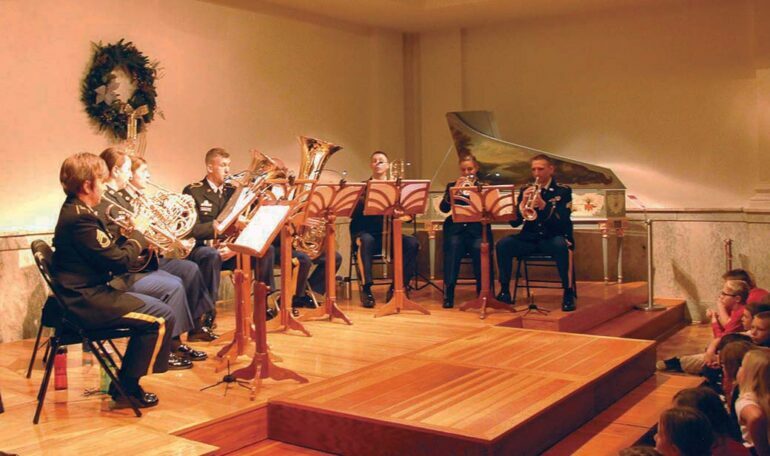 Patricia Bornhofen, NMM communications manager, said the process for booking bands like the SD Army National Guard band can take a year or more to set up. “(It’s) the biggest concert of the year for the National Music Museum,” Bornhofen said. Timothy Schorn, a director and associate professor of international studies and a tuba player in the band, said he enjoys coming together with the band and playing music. “We have a lot of fun coming together and performing, and especially something like this is really special for us,” Schorn said.